Do you have a small task (graphic design, page layout, UI) you wish you had someone do, in an affordable way? What if you could tap into a marketplace of students who could do those tasks for you? Ninjathat (www.ninjathat.com)--recently graduated from the Dreamit Ventures accelerator in Philadelphia--is a Los Angeles startup creating a marketplace for connecting students with small jobs--"missions"--for working professions, alumni, and businesses. We caught up with Co-founder and CEO Atif Siddiqi, who told us about the service. Atif Siddiqi: We've created a student centric marketplace, that allows businesses, working professionals, and alumni to hire student workers on demand. We saw the pain point, where student debt is rising, to an average of $26,000, and 53 percent of recent graduates are having a hard time finding employment. We allow them to build up their skills now, so that when they leave school they'll have higher wages, jobs, and other opportunities. And, we're building that for them while they're still in school. We're tracking data and recommending missions based on the skills they want, so that they can have more opportunities when they graduate. How does the service work, and can people use it yet? Atif Siddiqi: If you look at the marketplace, there are two segments -- skilled, and unskilled. We're focused on the skilled labor part of that, knowledge-based tasks. Some of the more popular tasks there are for designers, UX, photographers, and videographers. Obviously, students can provide skilled labor at good prices. As a designer, I can post a mission, and you can check out my portfolio of work, which is then completed and hosted on the site. The student Ninjas that relate to a mission will bid on it, and ultimate, you as the poster decide who you want to choose to do your mission. You provide payment when the mission is complete, and the payment is handled through the site. We also rank and rate students after they've completed a mission, which helps them build a reputation, as well. Where'd you get the idea for the company? Atif Siddiqi: We've been operating in the college space since 2005. My cofounder Atish ran Black Sheep College Media, which was like The Onion for college. I had been working with him over the last couple of years, and we took that to 23 campuses, and this year are doing around $1M in revenues. With that, we saw the pain point in hiring students on an annual basis. We hired around 500 for various tasks around the business, and found the process was time consuming, fragmented, and not necessarily reliable. We thought, there has to be a better way to do this. We started to get contacted by big brands to use students for their own purposes, and could see there was lots of value in supplying a labor marketplace. We wanted to create something reliable, safe, trusted, and efficient, where real-time supply can meet real-time demand. What's your background--were you guys in school when doing this? 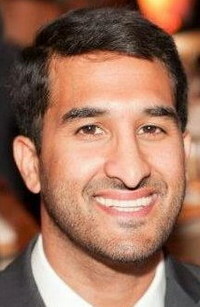 Atif Siddiqi: My cofounder started his company at the University of Illinois. I went to USC, and was doing grad school and my MBA when I met Atish. After graduation, I worked at Warner Bros. Film and television, and was attracted to joining the startup scene a few years after. How'd you end up an an accelerator in Philadelphia? Atif Siddiqi: We looked at a lot of accelerators. We thought it was a really good fit to what we're doing. Their network was really amazing, and they've been around, and we really understood their structure and process. Plus, they've had some other successful hits in the college space, including NOteHall, which was sold to Chegg. Plus, what made it interesting, is with the market we're serving, we're trying to focus on metropolitan areas with a high density of schools. They had that, plus it was good to be on the East coast, where we could get some good connections into cities like Boston, New York, and Philadelphia, and to learn the markets. Having been in Philadelphia, how would you compare what you saw there with the entrepreneurial environment in Los Angeles? Atif Siddiqi: Philadelphia was interesting. We've seen LA grow over the years, and are bullish on the LA scene. Philadelphia was interesting from a geographic perspective, to see how close knit the town was, and how much involvement there was by the city. There are lots of cool things going on there. First Round Capital just relocated there, and there is a lot of stuff happening on the university level. One good thing they have going on here, is there's lots of talent coming out of schools there. There are Ivy League schools, the University of Pennsylvania, Drexel, and others, so there's a considerable amount of talent here. It's nice to see the level of involvement students have in the community, the entrepreneurship, and the buzz. Atif Siddiqi: We're relocating back to the West Coast, and we've just launched a $500,000 seed round. We're going to be back in LA, taking meetings and raising money here. We really like the LA community, and we're bullish on the tech scene. Plus, it's one of our markets, because there's a great number of schools in LA as well. How far and wide is your service available at the moment? Atif Siddiqi: We're in private beta in Philadelphia and Chicago right now. We'll launch a public beta next year. Our plan is to have 8 cities, across 32 campuses, first focusing in on metro areas with a high density of schools in the area.